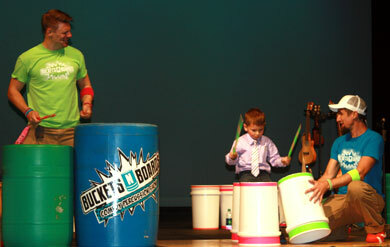 BucketsNBoards, billed as a comedy percussion show, bombarded last Saturday’s audience at The Clausen Center in Holstein. What a bang-up way to start Season Six! Matt Levingston and Gareth Sever wielded their drum sticks like hungry men at Thanksgiving and tap danced like a couple of guys gone mad. They set the theatre aroar with laughter. Belly laughs exploded like bombshells and “Boo Yahs” ricocheted off the walls. The name of the game was fast paced hilarity – broad farce at its best. 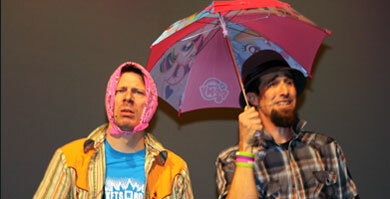 In one spoof Sever sported a little bitty cowboy hat that made him look like Woody from Toy Story. Levingston sang outrageous lyrics: “If my nose was running money, honey, I’d blow it all on you.” Then the two funny men pulled out recorders and commenced to playing them with their noses. The younger set loved it and literally bounced on their seats. Some of the older folks winced a bit and maybe even sent up a fervent prayer that their progeny wouldn’t try that at home. Aside from all the tomfoolery and larking about the stage, Sever and Levinston are quite good musicians. Who knew you could get so many tones from a propane tank or, for that matter, from a five gallon pail or a hard hat? Their musicality and sense of rhythm has to be good to allow them to horse around as much as they do. There is nothing pretentious about these guys. They just plain have fun on stage – as well as down in the audience. That’s where they found young Max Breyfogle impeccably attired in dress shirt and striped tie. He was presented with drum sticks; plunked down in front of a bucket; and asked to make some noise. With blissful aplomb, he outdrummed the professionals and when they told him “OK; go crazy!” he grinned a big one and went wild. It was the hit of the evening. The second set opened with tap dancing and hand drumming while Sever sang “On The Sunny Side of the Street”. This morphed into “Singing In The Rain” accompanied by stage effects of thunder and lightning and then melded into “Ain’t No Sunshine When She’s Gone”. Lest the situation lose its loonyness. Levingston donned a rain scarf as he whaled away on the conga drum. Crowd pleaser? You bet. The duo finished by honouring the men and women serving our country and the countless families waiting for their return. “Sing along.” they said as they strummed the opening chords of “America, The Beautiful”. It was a moment of stark contrast to all the revelry that had gone before. Laughter is good medicine for difficult times. Without a bit of foolishness now and then, this world might well run the risk of becoming a dour old planet indeed. Thank goodness we have performers like BucketsNBoards to lighten our load a little. As Mr. Spock was wont to say, “May they live long and prosper.”.